A specialist in the identification and classification of trees and shrubs. Someone who practices deontology; that is, duty or moral obligation. The science of duty; that branch of knowledge which deals with moral obligations. Coined by the English philosopher Jeremy Bentham (1748-1832) in 1826. A physician who has been trained to treat problems relating to the skin, scalp, hair, and nails: Treatment methods by a dermatologist include medication, surgery, or the destruction of unwanted growths by freezing, burning, lasers, and radiation. © ALL rights are reserved. 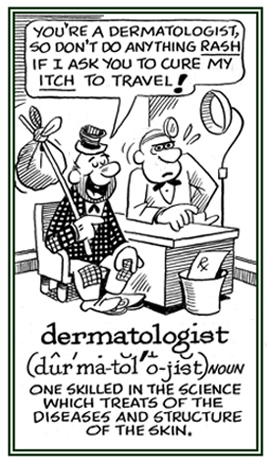 A branch of medicine dealing with the skin, nails, hair and their diseases: Dermatology is involved with the study of the physiology and pathology of the epidermis and its appendages; such as, sweat glands, oil glands, or the outer layer of the body's skin. © ALL rights are reserved. 1. The classification of skin diseases. 2. 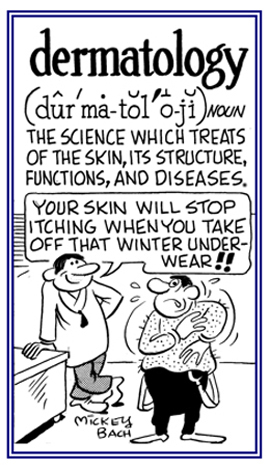 The science of the nomenclature and classification of diseases of the skin. A reference to a disease of the skin. A branch of human studies that provides scientific descriptions of individual societies of people. The branch of anatomy dealing with the study of ligaments. 1. The study of diseases that affect the ligaments or tendons. 2. The study of abnormalities of ligaments. Showing page 20 out of 80 pages of 1193 main-word entries or main-word-entry groups.